Safway helps the world get closer to the 2010 Winter Olympics in Vancouver. Inc., to provide and coordinate an extensive amount of scaffold products and services. 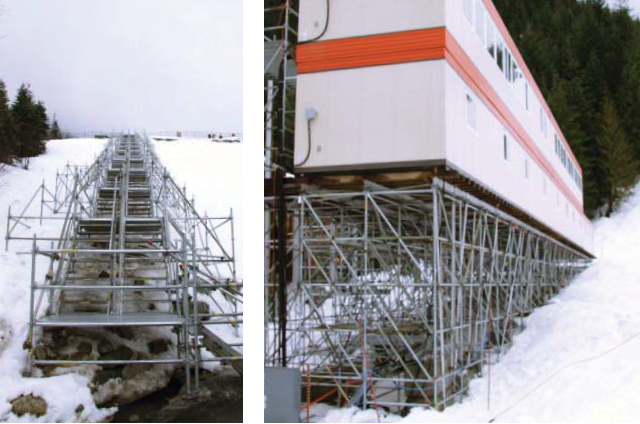 NUSSLI, a European special events contractor, hired Safway to supply scaffolding equipment for the Olympics’ competition and non-competition venues. Safway was NUSSLI’s local support for the project, which included supplying logistics, material, labour, and engineering services as required. Safway branches across Canada shipped equipment into Vancouver to support the Olympics’ scaffold requirements, the furthest of which came from Hamilton, Ontario. There were many challenges in the builds, which varied based on location and venue. Wind, seismic, and resonance were huge challenges in the city venues, while wind and snow loading were the big challenges in the mountains. mountain builds during the summer and fall months. “Preplanning, logistics and project management we all key reasons for success,” said Safway Vancouver Branch Manager Jeff Remfert. In total, more than 600 scaffolds were built, with camera towers as tall as 60 feet and pedestrian bridges ranging from 26 to 65 feet. Working with Show Canada Industries, Inc.
opening ceremonies for the Paralympic Games. The design capabilities of the project enabled Safway to outline a quality product without sacrificing our portion of the contract with NUSSLI. By designing a common seating riser that could work with our existing SafLoad shoring equipment, Safway could complete the installation according to the very aggressive schedule in the contract without impacting our supply of SafLock™ to the 2010 games.